‘There’s only a yard of stuff in it, worth a pound, if that,’ I went on, horrified by the waste of money. observations: This is the archetypal Clothes in Books extract, discussing the very philosophy of what makes clothes important. I was reminded of it by a discussion with the fabulous writer on popular culture, June Thomas (follow her on https://twitter.com/junethomas to find out what she’s writing about now), where we noted that books feature clothes endlessly, but they don’t often describe that feeling of buying something wonderful just for its beauty: for example, buying expensive gorgeous shoes rather that utilitarian ones. You can keep warm with a nice fleece – so why did people buy Schiaparelli jackets? Cedric says it’s a work of art, which is one justification, but that’s not the whole psychology behind it. And why does this trope not appear in books when we all know it exists – is it because it’s hard to make the buyer sound rational and sensible? There are lots of worthy women scrimping to dress well or buy a special frock – Little Women and Ballet Shoes– but that’s not the same thing. If you have counter-examples we’d love to hear about them. Nancy Mitford would always have been on Cedric’s side – unlike her narrator Fanny. 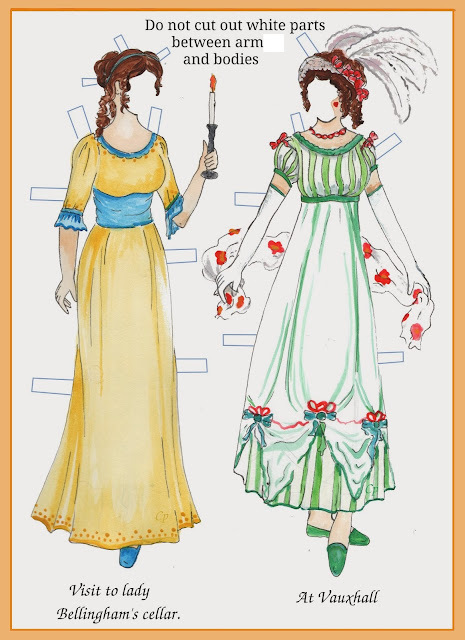 There is more of Fanny and choosing clothes here, along with a little more on Nancy’s appearance; and this book has featured before here and here - clothes, always clothes. Links up with: David Copperfield in an entry last week was willing to spend money for vanity, and Stella Gibbons’ characters are interested in whether feminists should spend money on clothes: Women having it all. Schiaparelli again: The slender girls are sharing dresses on a very commercial basis. 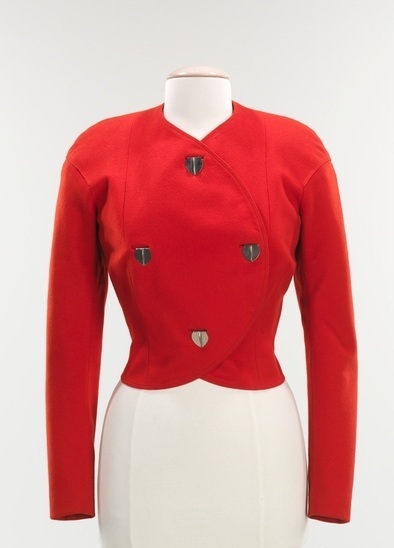 The picture – yes it is a Schiaparelli jacket – can be found on the rather wonderful Ye Old Fashion tumblr. Moira - Oh, there's definitely something to be said for having clothes for the sheer joy of it. I really do understand that and you're right; there's not a lot of that kind of discussion in books. Well, at least not in the books I read. Good point! Such tiny waists. In my local antique shop they were selling a pair of genuine landgirl trousers. They were a fairly large size in the hips and legs. But the waist - tiny.